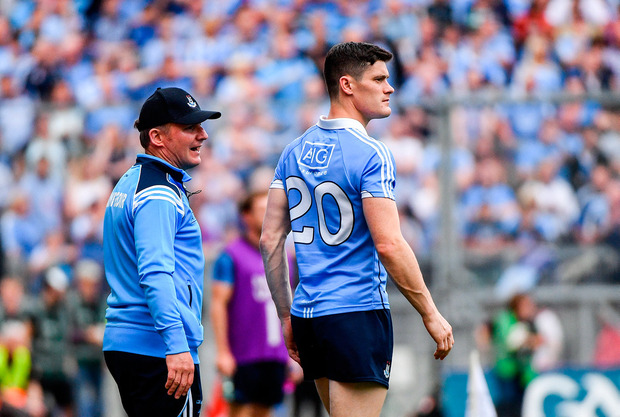 JIM Gavin has not ruled out a potential return to the Dublin squad for Diarmuid Connolly this summer, although he confirmed that the St. Vincent’s man is not currently part of the panel. Speaking at a promotional event for this year’s Leinster championship in Trim today, Gavin left the door ajar for a return for the man he made vice captain in 2013 and insisted that he 'respected' Connolly’s decision not to play either for Dublin, or St. Vincent’s in their recent Dublin SFC victories over Skerries Harps and Na Fianna. However, it is increasingly likely now that Connolly’s only involvement for Dublin in 2018 will be his brief cameo in Castlebar at the end of February as Gavin's squad assembled this week to begin their Leinster SFC preparations. "Well the situation is that Diarmuid just hasn’t been available, to play club football, in the championship, football and hurling with his club, and with the county as well," Gavin outlined. "We respect that position, and hopefully everyone does as well. It is an amateur sport, but that said, the door will always be open for Diarmuid, and I know for sure with the club and also the county, and hopefully we’ll see him back playing Gaelic games soon." Speaking after the league final last month, Gavin indicated that Connolly would play for Dublin this summer despite opting out of the panel after that league victory over Mayo. Last summer, Connolly was consigned to the Dublin bench for the first time since 2010 after sitting out a 12-week suspension, although his influential performance in the second half of the All-Ireland final merely underlined his importance to Gavin’s side.